Bad Things Can and Do Happen With Social Media | itsme. Social media allows me to indulge my stalker tendencies. It allows me to glimpse into many lives without them knowing. It’s creepy isn’t it? Thank goodness I am not some weirdo pervert looking to exploit the fact that your favorite thing to do is take pictures of your feet in public restrooms as you are going. Yes, I have heard some people do that. Or some person. Not me. There are so many social media venues out there that I could spend a whole day overindulging in how weird you people can be. Instagram, blogging, Facebook, Youtube, Vine, Tumblr, Google+ and even Linked In. I can check you out and then see who you are friends with, kind of like that six degrees of separation thing. Eventually I can find someone somewhere down the road that knows someone that I once met some place. Or. I can meet someone that I have never met before that lives in Australia. I can become their ‘follower’ on one platform. Then, I can usually find their Facebook account, their Instagram account, their Twitter account and sometimes even their blog. I can continue to comment and have conversations and can come to think of them as friends. I can learn many intimate details about their lives and I in turn can over share with them. I know, it just keeps getting creepier doesn’t it? Now, you might share things that are very private and personal on your Facebook account, but you might divulge some pretty intimate things on Instagram (like taking pictures of your self while peeing in public restrooms, even if it is only your feet I still know your pants are down!). Your level of sharing may be influenced by who follows you on these platforms. Like, your mom might follow your Facebook account so you keep it pretty clean. But your mom is not savvy enough to know about Instagram so you can let your hair down a bit more. If Instagram is not where your private stuff is exposed there is Twitter. I’ll just say one word Weiner. Actually that’s two words, a last name and a…noun. But you see how much I am finding out about you already? All this social media is kind of like the People Magazine of the not so famous. And people are making money off these things. Some one has a web page of Instagram photos from the very, very, very rich kids called, ‘Rich Kids of Instagram.” They also have a book of the same title. Can’t believe I didn’t come up with that! Here is the really, really creepy part. I can go to your Facebook feed, share your photo to my timeline then open up my Walgreens app on my phone (which I love and HIGHLY recommend) and print your picture. Right from Facebook! I could also save your Facebook photo onto my computer. For instance a photo of Johnny Depp. I could open said photo, jack around with it (pun intended) and then insert my new creation into a different photo making it look like Johnny Depp was spending time with someone he really wasn’t. But the recreation is so good that the untrained eye doesn’t realize it’s fake!! This is how rumors get started my friends. I am not that kind of creeper, but, sadly I am a victim of this kind of creeping. Yes, this has happened to me in real life. I am going to show the photo to you all here but let me remind you, this is a recreation and did not happen!! 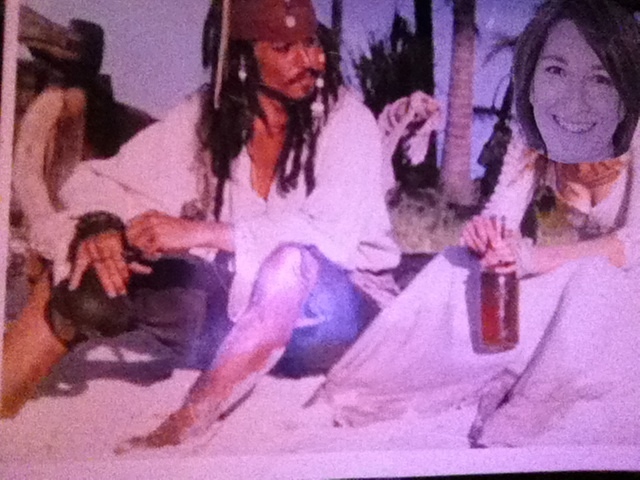 No, I have never actually been to the beach with Captain Jack Sparrow. WOW does that look real, you could have fooled me! I think all this social media is a bit unsafe when used by the wrong people. I may steer clear.